An easy and versatile recipe which works well with larger roasts which might be a bit on the tough side. In this case, the whole bone-out front shoulder from an old mule deer doe: tons of flavor, but not particularly tender when cooked rare. 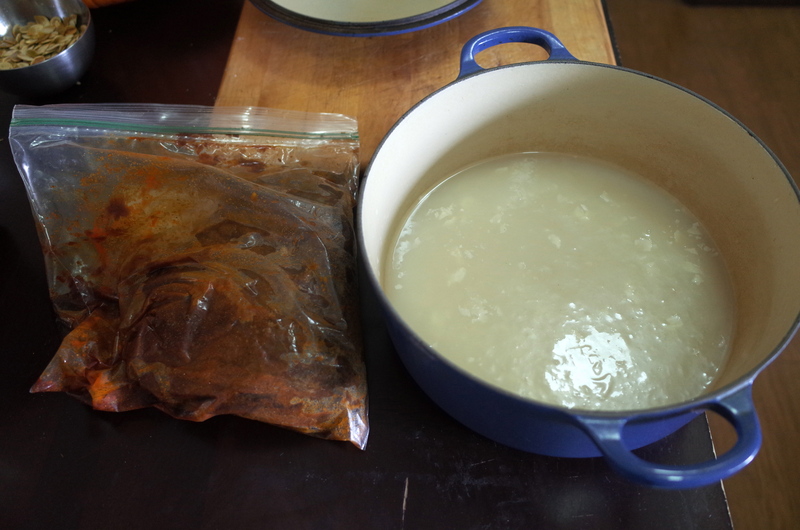 First thing you’ll need is the venison marinating in the rub, in a ziplock, for 4-5 days in the fridge. 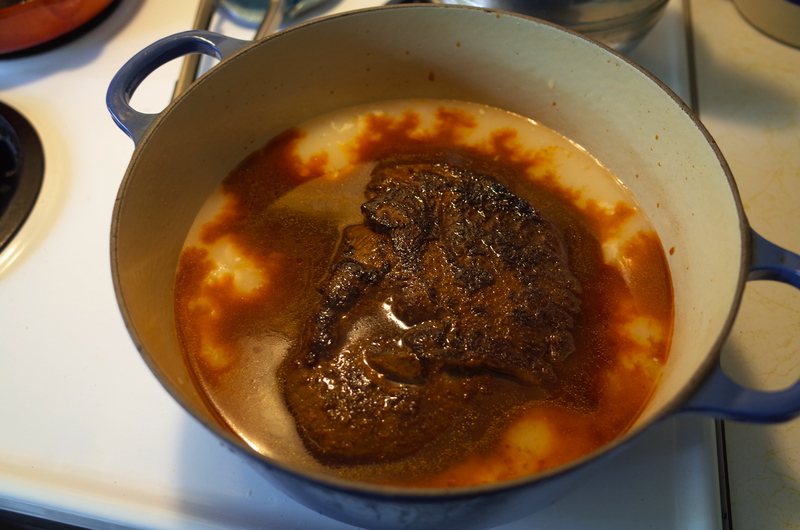 The rub is made with a very large amount of sea salt and brown sugar (perhaps as much as a quarter cup each for a 5+ pound roast), and a merely large amount each of paprika, curry powder, garlic powder, and coriander. A bit of olive oil will help the spices stick in a more even manner. Second you’ll need some fatty animal stock, in this case chicken stock I made at home. This is the key to making things moist, so you’ll need quite a bit, probably a quart and a half for a 5 pounder. Put some oil in a cast iron skillet and give the roast a nice brown, then put the roast in a big baking dish, with the stock, and cover with a tight fitting lid. 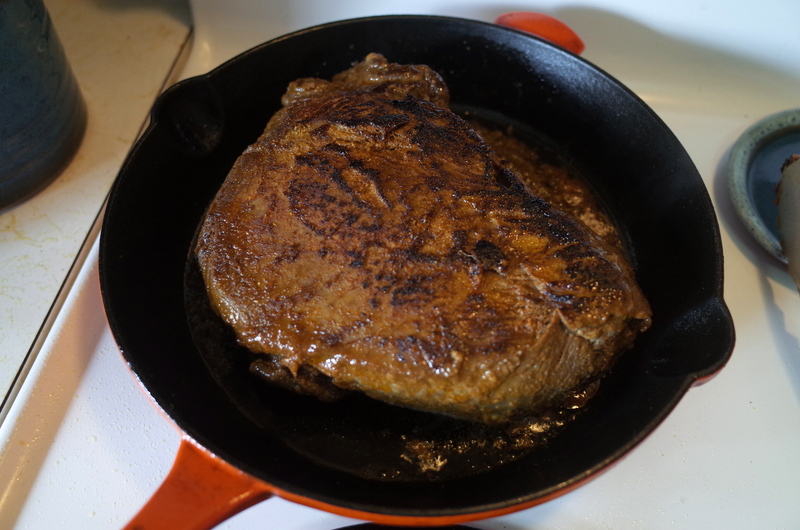 Use some beer or bourbon or whiskey to deglaze the pan into the stock. Bake in the oven at 375F for 4-5 hours. You want to get to the point where the meat can be shredded with a pair of forks. Check periodically and add liquid as necessary; there should be around 2 inches at all times. 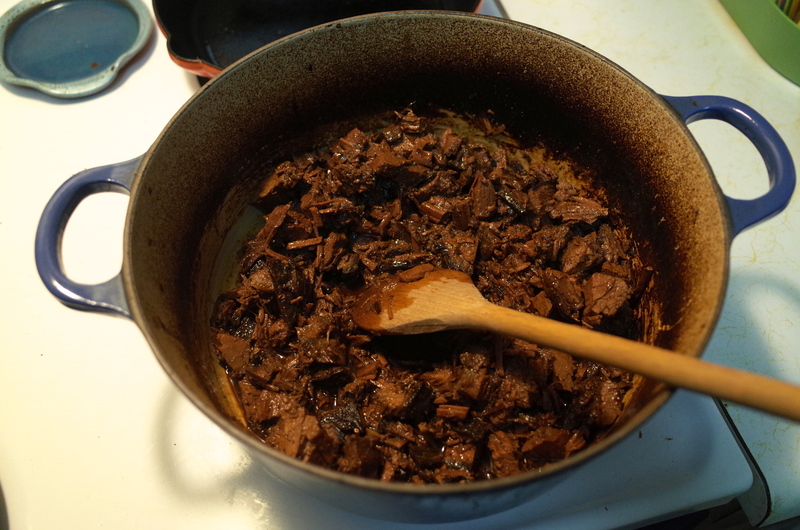 Once done, shred the meat and mix thoroughly with the broth, then serve. This works on sandwiches, in burritos, and plated with traditional dinner sides like mashed potatoes. You can also cook it with veggies and potatoes and end up with a spin on traditional pot roast. For spice lovers, add a pile of well chopped onions and jalapenos before cooking, and serve with rice, beans, and guacamole.